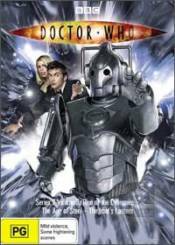 Three more superb episodes from David Tennant's first series in the TARDIS, this DVD finds Doctor Who facing one of his deadliest opponents - the Cybermen! Upon landing on an alternate version of the Earth, The Doctor, Rose and Mickey learn that Peter Tyler is apparently alive and well. Lurking in the shadows are creatures made to destroy - one of The Doctor's greatest fears have come true... the Cybermen are reborn. Lumic's army of Cybermen is on the rise, and with more and more people being converted by the hour, time is of the essence. The gang are reduced to fugitives as they roam the streets of parallel London trying to rid the Earth of Cybermen. In 1950s London, the police are hunting down strange, mute creatures. The people of Britain gather around their new-fangled "tele-vision" sets to celebrate the new Queen's coronation - but is something affecting the signal?